When Catherine the Great died in 1796 a whole new period in Russian history started. Catherine's son Paul I introduced some ultra-conservative policies, curtailed the power of the St. Petersburg local administration and made several major steps towards turning Russia into a bureaucratic state. The worst fear in Paul's life was the fear of being assassinated. In an attempt to protect himself from the threat of assassination, he built a fortified palace for himself - the Mikhailovsky Castle. However, his paranoia was little help in the end and Paul was assassinated on March 12 1801 in his private bedroom in the newly built castle members of the Royal Guard. Ironically, the coup was primarily engineered by his son Alexander, who had sworn to continue the policies of his grandmother - Catherine the Great. On his assumption of power, Alexander I introduced a series of political reforms, which entirely restructured the government and included the creation in 1802 of a system of ministries with ministers reporting directly to the monarch and the founding in 1810 of a State Council. For better or for worse, bureaucracy began to flourish in Russia. St. Petersburg rapidly became an ordered and bureaucratic city, something that was only echoed in the orderly layout of its street plan and the heavy policing of its avenues. During the reign of Alexander I the Russian army successfully stopped Napoleon's invasion of Russia and drove the French army back to Paris (1812-14). The captured French banners were put in the newly built Kazan Cathedral, where the Russian army commander, Field-Marshal Kutuzov, was buried in 1813. In the Russian Imperial capital it was deemed necessary that everything look orderly and measured. It was the heyday of architectural ensembles and perfectionist "classical" designs. The Admiralty, the naval headquarters of Russia, was remodeled between 1806 and 1823, the Stock Exchange and Rostral column ensemble was built at the Southern edge (Strelka) of Vasilievsky Island, Arts Square and the Mikhailovsky Palace (1819-25) were designed and built by the Italian architect Carlo Rossi and in 1818 construction work began on the magnificent St. Isaac's Cathedral. When Alexander I suddenly died in the town of Taganrog (some say, he ran away to Siberia to escape the heavy burden of power) in December 1825, a political crisis erupted. A group of liberal young army officers (later called the "Decembrists") started a revolt, hoping that Nicholas I, Alexander's younger brother, would have to sign and endorse a National Constitution. They brought their soldiers to Senate square by the Bronze Horseman, but remained inactive. The uprising was cruelly crushed, the five organizers executed and the rest exiled to Siberia. In response to the Decembrist Uprising the new Emperor, Nicholas I, chose to adopt a much more conservative series of policies and Russia once again degenerated into an economically backward bureaucratic state. In the Imperial capital, St. Petersburg, the desire for military-like orderliness reached ridiculous heights and military order was established throughout the city in all manner of institutions. Paradoxically, culture flourished in St. Petersburg despite this oppressive regime. Alexander Pushkin wrote some of his best poetry, before being killed in a duel in 1837, Mikhail Glinka, one of the first great Russian composers, wrote his best operas and chamber music and Fiodor Dostoyevsky lived and wrote in St. Petersburg between 1837 and 1844. Despite its obvious economic backwardness, which resulted in a humiliating defeat in the Crimean War (1853-56), Russia was gradually moving down the road of technical progress. In 1837 the first Russian railroad was opened, connecting St. Petersburg with the royal residence at Tsarskoye Selo (Pushkin) and in 1851 a second one was constructed to connect St. Petersburg with Moscow. In 1850 the first permanent bridge across the Neva River was opened, replacing the temporary pontoon bridges that had been used previously. 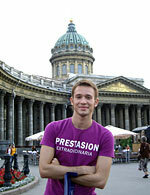 The city of St. Petersburg gradually became more and more majestic. 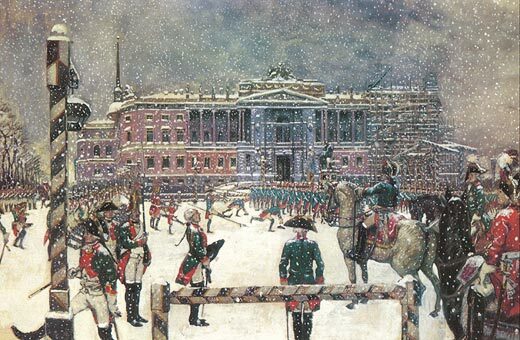 The Palace Square ensemble was completed with the construction of the General Staff building in 1829, the Alexander Column in 1834 and the Royal Guards Staff building in 1843. Between 1839 and 1844 the Mariinsky Palace (today home to City Hall) was built for Nicholas' beloved daughter Maria and St. Isaac's Cathedral, the main church of the Russian Empire, was finally completed in 1858, after the death of Nicholas I and after his son Alexander II had acceded to the throne.